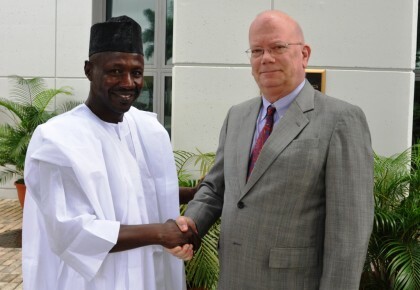 Wilson Uwujeren, Abuja: The outgoing United States Ambassador to Nigeria, His Excellency James Entwistle has commended the Acting Chairman of the Economic and Financial Crimes Commission, EFCC, Ibrahim Magu for the vigor he has brought to the fight against corruption in Nigeria. He said the best part of his time in Nigeria was strengthening cooperation with law enforcement agencies especially the EFCC. “It is in our interest to see Nigerian law enforcement capacity grow. It is not enough to complaint about things. We have to help our friends. I am proud of the EFCC and privileged to be of some help,” he said. He expressed delight that that President had already asked the National Assembly to confirm the appointment of the EFCC Chairman and wished him well. The envoy made the remarks Friday July 15, 2016 when the EFCC boss visited him in his office. The EFCC Chairman said the purpose of the visit was to wish the departing envoy fare well. He said he had enjoyed close working relationship with the United States government during the tenure of Entwistle, adding that it is significant that the envoy is leaving at a time the Commission is having its best relationship with the US. Magu thanked the envoy for his support and cooperation. ”Even when you leave, do not forget us. Continue to be our ambassador,“ he declared. He also urged Ambassador Entwistle to continue to monitor his performance as chairman of the EFCC, assuring that, having come this far, he would never compromise his integrity in the fight against corruption.